With Seattle in the rear-view mirror I headed for home. During my 2011 trip, I had a very long two day ride back home. The journey taken was almost completely down Hwy-1/101, a little over 1,400 miles total. I rarely set out with much of a plan, so it was not my intent to over-extend myself. 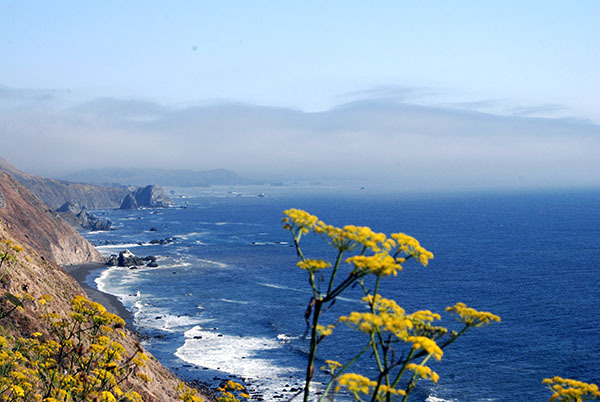 The first day I rode from Seattle to about 5 miles before Crescent City, which is the first city arrived at when crossing from Oregon into California. This journey was approximately 520 miles. 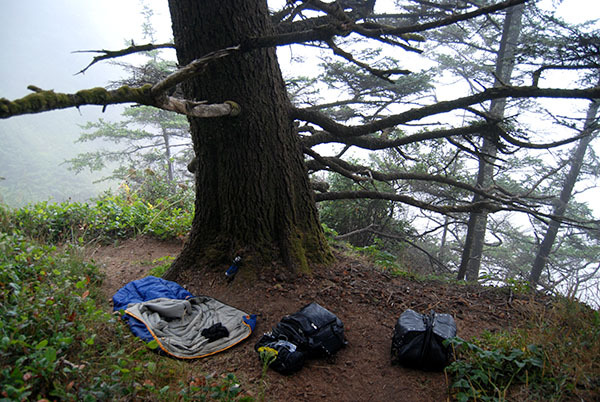 I slept in my sleeping bag laid out on a footpath leading down a cliff, a bit off the highway. It wasn't the most comfortable, but it was late when I decided to stop (around 11 at night). I was tired and cold, and ready for some sleep. Where I slept wasn't of much importance. The second day I was back on the road by about 8:30 am. I didn't spend anytime messing around, instead I packed up my things, loaded my bags and headed into Crescent. I was on reserve at this point, and very lucky not to run out of fuel. I made it in, fueled up and did a quick repair on my bike (if memory serves, I was having interference issues with the rear tire). All this took approximately an hour, once finished I was back on the road. Aside from food, coffee and gas, I didn't stop riding until 5:00 am the next morning. Riding through the night down the California coast with a very modest windscreen and summer clothing is not an experience I want to repeat. I had no real reason for pushing myself for so long, other than to do it. I did eventually arrive home though, and proceeded to immediately collapse into bed and try to warm up (which only happened with limited success). It was a great trip, and it was over. In 2012 things went differently, due in no small part to the fact that we were traveling by motorhome at this point. We took the 5 south until arriving at the 199, at which point we went across to the 101. We slept in Eureka that night, still unsure exactly how we were going to get the motorcycle home. We trialed having my girlfriend drive the RV, but considering she's used to driving a tiny Peugeot hatchback, on the opposite side of the road and while sitting on the opposite side of the car (shifting with her left hand), she struggled. In the end it was clear, that an alternative must be found. I was growing slightly worried, but not giving up on the possibility of a solution. We decided to think it over some pizza. While tossing over solutions in my head, an idea struck. It was a bit crazy, a bit far-fetched and a bit ridiculous, to say the least. But we were in a position of mild desperation, and I was willing to try anything I thought could successfully transport the bike back home (short of paying someone to do it for me). The plan? Our motorhome had a square rear bumper, fabricated from sheet metal like the one above. It's very simple, and quite common for RVs. It also had a spare tire carrier that was designed to fit this bumper using square u-bolts, also like the one above. Usually the spare tire would stick straight up, but since the bumper was square, there was no reason it couldn't be placed in a different angle. So, I unbolted the spare tire carrier, and re-bolted it lying flat, pointing straight out the back (without the spare tire on it). 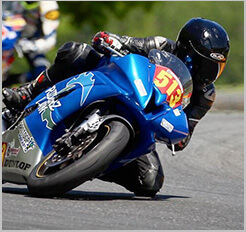 This gave me a platform for the front tire of the motorcycle. 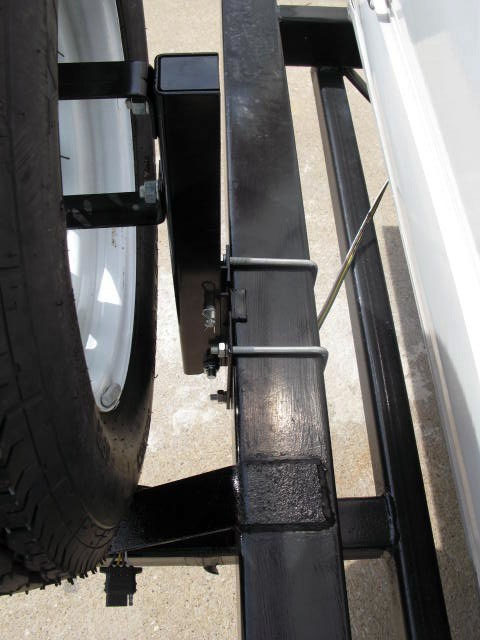 I could roll the front tire onto the carrier using a length of wood as a ramp, and use ratchet straps purchased from Walmart to hold it vertical and attached to the RV. Not following? Well this is about the best picture I have of the solution. Notice I also strapped the front wheel/tire to the platform…safety first people. Did it work? Yes. Was it sketchy? Oh yeah, you bet. We still had about 700 miles of driving to go at this point, with a motorcycle haphazardly strapped to the back of our under-powered RV that can hardly get out of its own way, let alone do so with a bike hanging off the back. But it made it home. Going up the Grapevine was a real chore for the carb'd 20R Toyota I4 (which produces a laughable 90 hp and 120 ft lb torque when new, only slightly more than the Honda Magna it was pulling), and momentum was something I had to harness. 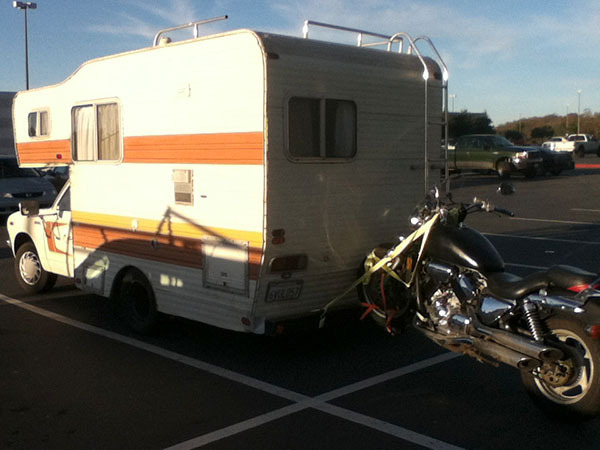 At one point while parking the RV one of the straps slipped a few revolutions, causing the bike to lean over severely. Fortunately it happened at 5 miles per hour and not 50. The fight for survival aside our return trip was pretty basic. We stayed a couple nights in LA, pulling the bike off and cruising around the city visiting all the sights from the Getty museum to Venice beach. When it was time to go home, we re-mounted the bike and headed back. Words couldn't describe how relieved I was to arrive back home without having to watch the motorcycle sliding down the highway in my side mirror. Throughout the ordeal I couldn't help but laugh about the ridiculousness of it all, and surely if a police officer looked twice there would have been trouble. But we had made it, and the bike was unscathed. Getting your blood circulating during stops is an excellent way to boost energy and burn a few calories, but be careful not to exhaust yourself before going back out on the road. Simply taking a walk is a great way to increase circulation, stretch out your muscles, and relieve stress.